Most Lego cities are well-planned models of urban order. 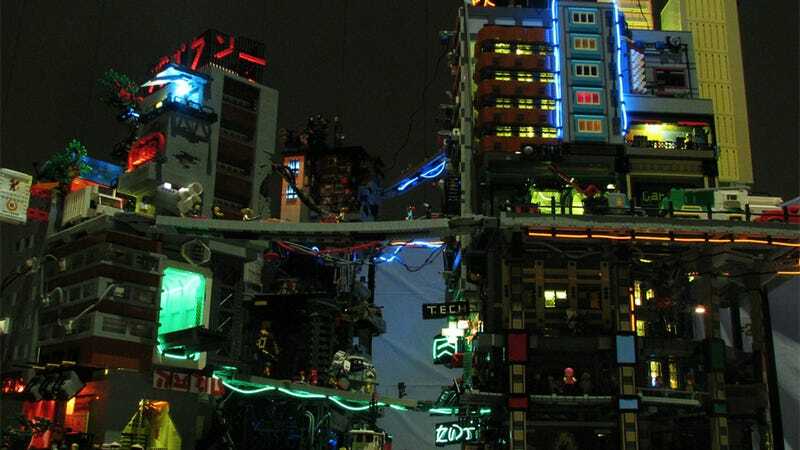 But at Brickworld this year, a team of six builders led by Carter Baldwin created this intricate model of urban disorder. Their unique version of Neotokyo borrows from a handful of great cyberpunk novels and movies, from Akira to Neuromancer. Baldwin worked with Nate Brill, Kyle Vreze, Forest King, Ignacio Bernaldez, Sam Wormuth, Alex Valentino, and Chris Edwards on the project, which includes rare or obscure pieces from Lego's Scala collection. It shows us a snippet of a futuristic city, where decaying high-rises leave fetid canals in constant shadows on the ground level. The level of detail is incredible, and including tangled wires, hanging laundry, and cyberpunk minifigs. The Japanese signage, meanwhile, is made from electroluminescent wire, and includes billboards for "foreign girls."